Fibrocartilaginous Embolism, commonly called FCE, is a disease process common in adult large and giant breed dogs. While it is very rare in cats and small breed dogs, any breed can be susceptible. This month we define FCE, discuss common symptoms, and prognosis. An FCE is often referred to as a spinal stroke. Strokes, just as in people, result from a blockage of blood flow. However in FCE cases, a piece of fibrocartilage most likely from disc material blocks a blood vessel in the spinal cord. This blockage and resulting loss of blood flow can cause damage to adjacent portions of the spinal cord. The severity and location of the symptoms depend on numerous factors including the location and size of the FCE within the spinal cord. Symptoms can include uncoordinated gait, muscle weakness, and paralysis. Any combination of the limbs (front limbs only, hind limbs only, same side limbs, etc.) can be effected depending on the location of the FCE in the spinal cord. The onset of an FCE is often very sudden and can be painful. Pain subsides very quickly and often times the symptoms such as weakness do not progress after the initial injury. 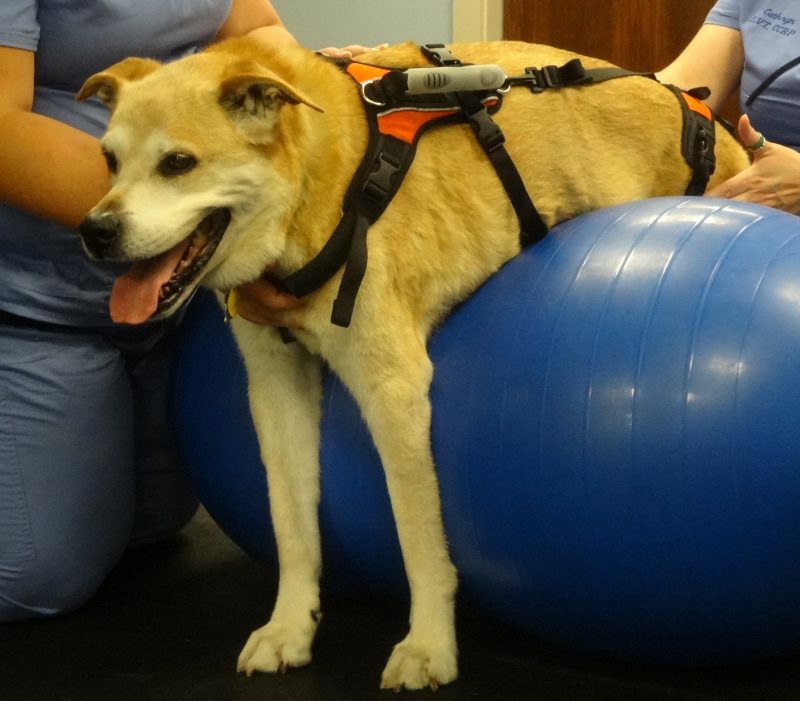 By the time a pet sees their veterinarian most pets do not demonstrate any spinal pain! Many pets begin to show improvement within 24-48 hours, with full recovery taking many weeks or months. Some pets may have some permanent damage. Physical therapy including range of motion, therapeutic exercises, underwater treadmill, cold laser therapy, and acupuncture can be very beneficial in speeding up recovery. Most patients make a nearly complete recovery from an FCE event and very rarely suffer a second FCE in their lifetime. Rehabilitation can help speed up recovery. Assistive devices and other tools can aid the family in caring for their pet until they are stronger. On our Pet of the Month page for March 2018, we share Peyton’s story! Peyton is a cat who came to us for rehabilitation after a probable FCE episode. 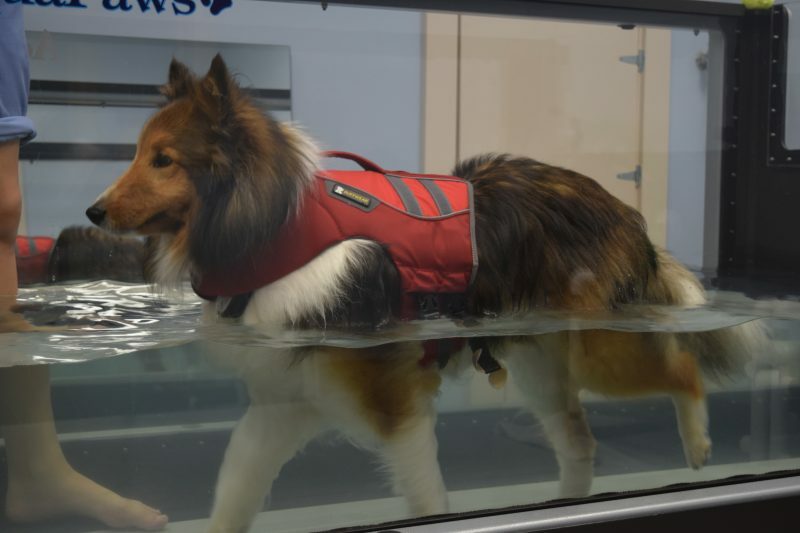 Pets in the photos for this blog were used for rehabilitation demonstrations only. Their use in this blog does not reflect their individual diagnosis.